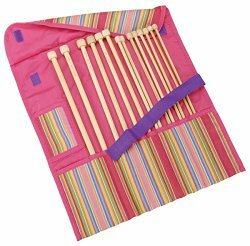 Bamboo knitting needles are warm to hold and are less slippy but they feel so nice to knit with. I came across a perfect set that ticked all the right boxes by Clover Takumi which were exactly what I was looking for. If you look at the picture to the right, you can see how many different varieties of needle you are given and the icing on the cake was that it came in it’s own pouch to store them all away but keep them altogether. There are even a few extra pockets so you can store away your counter, scissors and darning needles. I even manage to keep my tape measure in there too so it’s a one stop shop. 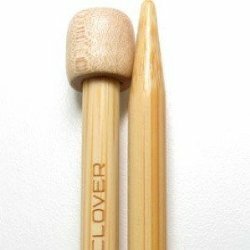 I really enjoy knitting with my Bamboo Set from Clover – it has all the sizes I need with the added advantage of a tidy and useful pouch. The knitting needle sizes in the set are US sizes 15, 13, 11, 10 1/2, 10, 9, and 8. They are all about 14 inches long. 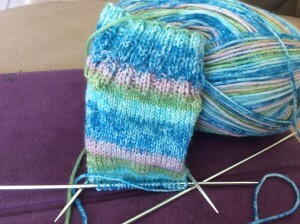 The bamboo is slick and slides easily through all the yarns I’ve used and feel so much nicer than the metal sticks. 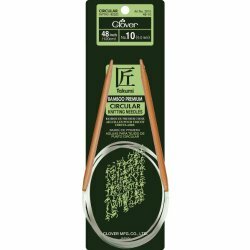 There are so many knitting needle styles to choose from out there and it can be very confusing. Let me de-mystify some of the different needles available. These needles are your classic long sticks which come in a variety of sizes and can be made from wood, metal or plastic. They generally have an end cap at one end to stop your stitches from falling off the needle. If you want to stop knitting then you can just leave the other end free but if you have a lot of stitches you risk losing some when you put your work aside or store it in your knitting bag. 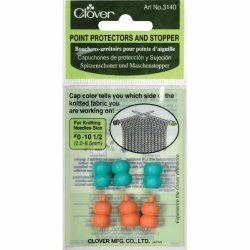 Investing in some rubber stoppers or point protectors that you pop over the ends can save you a lot of picking up dropped stitches and also protect the needle tips. These are lighter and more compact than the straight needles but do check your project requirements before using short needles as they may not be able to hold all the stitches you need. There will also be less wiggle room when you are trying to check your count. This is important when you are starting a project with a smaller number stitches such as a sleeve but need to increase out for the top of the arm or when you are working on the back. Try and choose a needle that will allow you to have at least 75% of the largest part of your project fitting on the needle. These needles are used for working in the round on projects like socks, hats etc. 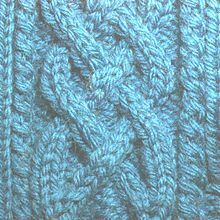 The needles are joined together by a long flexible cable which holds one needle at each end. There are a number of techniques you can employ when using them such as magic loop. When you work this way the full length of the needle including the cable should be a little shorter than the circumference of the work you will making. They are very easy to use – work back and forth in rows as if each end was an independent needle. The great thing about working this way is there is less sewing because the seam is already being knit together as you work around and around. 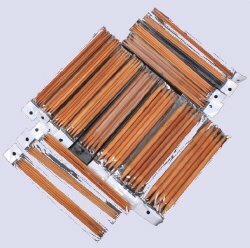 If you are a keen knitter you may want to invest in an interchangeable knitting needle set which allows you to mix and match from an assortment of tips and needle length as well as size. This can be space and money saving. You can choose between twist and lock or threaded. This a very specialized needle that will result in a dense and less flexible fabric so you will only need one of these if you are planning on making a project that requires the fancy cable design. They can be used on anything from thick chunky sweaters, cardigans and scarves to socks, blankets and many other projects. It doesn’t matter which needle you decide to use from this list and they may be different from one another but the one thing they all have in common is they vary in size and I’m not talking about the length. Before starting a project you will need to check the size of needle recommended on the band around your ball of yarn or what the knitting instructions recommend. It is also worth noting that knitting needles are labeled in different ways depending on where they were manufactured and sold. Always check a conversion chart if you are using a pattern from a different country to the needle you are using. You may find needles from UK, US, Canadian as well as Japanese sizes. For example a metric needle Size 5.0 would be a US size 8, a UK and Canadian size 6 and a Japanese needle size 10 or 11. 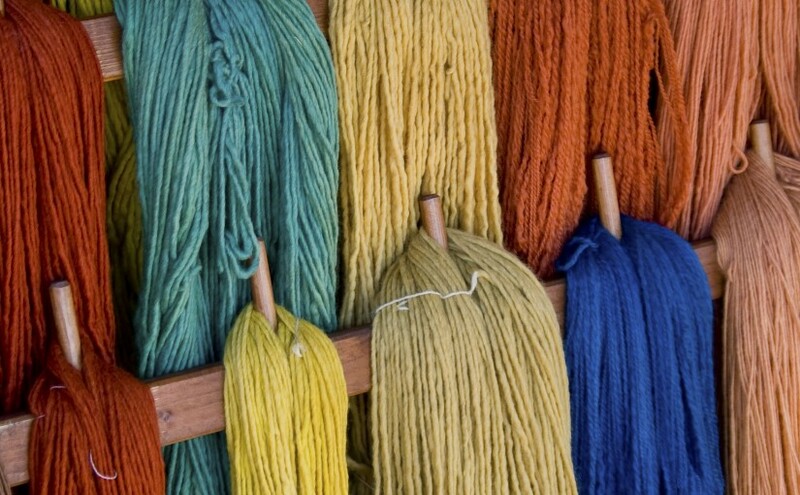 Using the wrong size needle and yarn will also affect your gauge so selecting the right needle for your project is essential. Previous Previous post: Pancake Day 2015: What Will You Give Up For Lent?